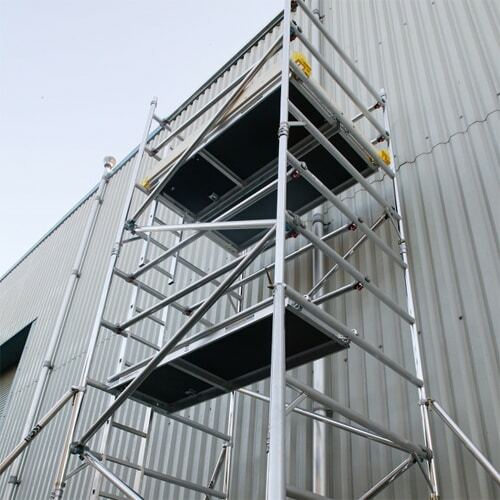 If you need to work at height, maybe to paint your house or clean the gutters, then you need a scaffold tower hire. Our aluminium scaffold towers are ideal for any domestic customer. Every scaffold tower hire comes with easy to read instructions. Each component of the tower is colour coded, for easy assembly. If you are hiring a tower for the first time, we recommend you have someone help you erect the tower, as two pairs of hands make for lighter work. We supply scaffold tower nationwide and offer a next day delivery service to all of our customers. Order before 3pm today to get your tower delivered before noon the next day, guaranteed! We currently offer scaffold towers up to 15.7m (51ft 6in) in height. Any tower above 8m or so, we highly recommend that you tie the tower in to the property or area you are working, for extra stability. Each tower is supplied with 4 stabiliser legs that can be adjusted, as well as 4 castors which make the tower mobile. These castors have around 4in of adjustment in them, in order to ensure the tower is level. Safety is our highest priority, therefore we have a number of safety checks that are carried out on every tower before going out on hire. Every aluminium scaffold tower has a safe working load of 275kg per platform level up to a maximum of 950kg per tower. Get low cost scaffold tower hire from the Hire Desk today at a highly discounted price. All our current customers are very happy with our service and have hired regularly from us. If you are still unsure if a scaffold tower is the right choice for you, feel free to give our team a call. We will be happy to discuss any questions you might have and ensure you get the right equipment for the job.